Police say a missed bus stop led to an unusual Christmas Day dispute involving the allegedly belligerent stepmom of a Hollywood celebrity, who, according to published reports, was supposed to have gotten off at the Park-and-Ride area off Rt. 412 and I-78 in Hellertown. Kate Major Lohan is pictured in a July 2018 booking photo from Palm Beach County, Florida. 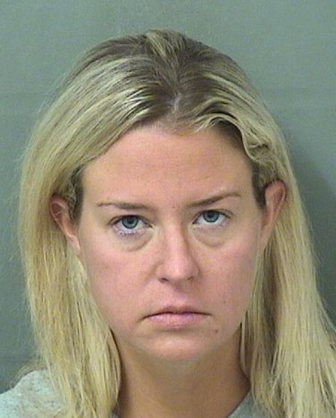 According to an article published by WFMZ.com, police say Kate Major Lohan, 36, of Boca Raton, Fla., was a passenger and intoxicated on a westbound charter bus when she allegedly began screaming at the driver and demanding that the bus be stopped. The celebrity news website The Blast identified the tour bus company as Bieber. Kate Major Lohan is married to Michael Lohan, the father of actress and singer Lindsay Lohan, although Lehigh Valley Live reported that that Kate Lohan filed for divorce in September. WFMZ reported that Kate Lohan allegedly lunged at the bus driver, grabbed her coat, refused to let go, and then somehow climbed into the driver’s seat, from which she allegedly tried to drive the bus before another passenger physically removed her from the seat. Although it is unclear why Lohan was in the Lehigh Valley, the Morning Call reported that she is a 2001 graduate of Allentown Central Catholic High School. She has been married to Michael Lohan since October 2014. According to Lehigh County online court records, Kate Major Lohan is charged with misdemeanor DUI involving a commercial vehicle (BAC of .04 percent or higher), misdemeanor DUI-Incapable of Safely Operating Vehicle, disorderly conduct (a third-degree misdemeanor) and summary charges of harassment, disorderly conduct and public drunkenness. She was released from Lehigh County Jail Wednesday after posting 10 percent of $2,500 bail, according to court records, which state that a preliminary hearing in her case is scheduled for Jan. 3 at 1:30 p.m. before District Judge David M. Howells Jr.
Lohan was charged in Lower Macungie Township, which is where she was taken into custody after the bus stopped at the Bieber bus terminal on Hamilton Boulevard, according to published reports.